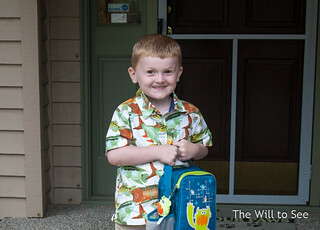 Will recently started his second year of preschool at the school we moved him to last November. He is so excited and happy, asking to go to school each day. After enrolling him in and removing him from a Montessori preschool last year (just not a good fit for him), we moved him to a traditional preschool run by the local Catholic Church. Although we are not Catholic, we love the values and teaching methods in the classroom. Both of his teachers have commented about how happy he is and that this is a great place for him. I also feel more connected to the teachers and other parents at this school. And most importantly, we know that they are his biggest advocates when it comes to preparing him while overcoming his vision impairment. This year, Will gets to stay an extra hour and have lunch at school too. It is good practice for him, since he will hopefully be in full day Kindergarten next year and eat at school too. He isn’t a good social eater (too much social, not enough eating), so I am hoping that he can learn how to do it this year. The expectations on preschool are so high now, practically requiring that kids come into Kindergarten reading. It is difficult to balance the academic needs for Kindergarten with the social needs of a child — playing, learning social skills and doing art projects. All of these are just as important for this age as learning letters and numbers. I am looking forward to a really fun year for Will.